President Muhammadu Buhari visited the US for a bilateral meeting with President Donald Trump of the US. The president held a bilateral meeting with his American counterpart on Monday, April 30 before their press conference. 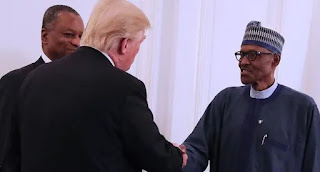 President Trump had commended President Buhari for the success recorded in the fight against corruption. He also said the US was ready to support Nigeria in the war against insurgency noting that the country just sold 12 Tucano fighter jets to Nigeria. President Buhari in his reaction applauded the US for the support provided and promised that Nigeria will not relent in the war on insurgency. He also vowed that his administration will work to make sure that the rest of the abducted Chibok and Dapchi girls will be rescued. Read full statement below: Good day, Ladies and Gentlemen of the media. It has been a pleasure and honour to visit Washington DC at the kind invitation of President Donald Trump. Nigeria and the United States share a long history of close and cordial relations, which encompass political, economic, military, social and cultural cooperation. Our two countries maintain a strategic partnership for peace and security, conflict resolution as well as the global fight against terrorism. We also share common features as secular federal states, practicing a similar democratic model of governance and committed to the universal values of fundamental human rights and freedoms, free enterprise, social justice and the rule of law. President Trump and his team and myself and the Nigerian team discussed issues related to security, trade, governance, human rights and humanitarian crises. SECURITY We congratulated the leaders of North and South Korea on their historic summit and we applaud them for the positive commitment they have made towards the denuclearization of the Korean Peninsula. President Trump deserves a great deal of credit for his statesmanly role in transforming so dramatically the course of events in that region. We also congratulated the US government on the important role it played in the defeat of ISIS, although some of the remnants have found their way to the Sahel region. We recognized the strong US support in our fight against terrorism and also appreciated very much the US’ agreement to sell twelve Super Tucano A-29 war planes and weapons to Nigeria to effectively fight terrorism. To contain the spate of insurgency in Nigeria, the Federal government has adopted a multi-sectoral approach, involving relevant government agencies to address the socio-economic and political dimensions while the Armed Forces of Nigeria assist the civil authority to provide security and maintain law and order. As part of efforts to address emerging cases of insurgency in the country, the Nigerian Military adopted a non-kinetic counter terrorism/counter insurgency approach code-named “Operation safe corridor”, to de-radicalize, re-habilitate, and re-integrate willingly surrendered Boko-Haram members into the larger society. This programme is currently embarking on a number of projects including: skill acquisition centers and integrated farms; comprising poultry, fish pond and greenhouse farming, among others. A number of international partners, including the International Organization for Migration have contributed to the success of Operation Safe Corridor. We indicated that we would appreciate whatever support we could also get from the US. We expressed gratitude for US support in the reconstruction and rehabilitation efforts in the North East of Nigeria, as well as humanitarian assistance to the Internally Displaced Persons (IDPs), through agencies such as the United States Agency for International Development (USAID) and other international partners. The USA has been to date the biggest contributor to the humanitarian response and last year gave approximately 500 million US Dollars in cash and in-kind contributions through the United Nations and other inter-governmental organizations. These have mainly supported protection activities, health, food assistance and shelter. We are doing all we can to secure the release of the remaining abducted school girls from Dapchi and Chibok. In this context, we will continue to welcome US collaboration in intelligence gathering, hostage negotiations and information-sharing. VIOLENCE BETWEEN HERDSMEN AND FARMERS The government is taking necessary steps to promote the peaceful co-existence of herdsmen and farmers, by focusing on boosting security and enforcing legislation that will guarantee herders and farmers access to land; TRADE AND INVESTMENT I extended sincere congratulations to President Trump and his government on the impressive performance of the US economy under their watch. Our aim is to diversify our own economy by focusing on agriculture and food security; power and infrastructure. We have cut the importation of rice by about 90% thereby saving a significant amount of money. We very much welcomed increased US investment in the Nigerian economy, especially in the non-oil sector. Economic relations between Nigeria and the United States are anchored on three major instruments, namely: the Bi-National Commission (BNC), Trade and Investment Framework Agreement (TIFA) and the Africa Growth and Opportunity Act (AGOA). The Bi-National Commission in particular, comprising bilateral political, economic, developmental and humanitarian partnership, is a basic economic framework for engagement between our two countries. Nigeria’s trade volume with the United States stood at $6.07 billion according to 2016 statistics and comprised $4.176 billion worth of Nigerian exports to the US and $1.894 billion US exports to Nigeria. We urged greater effort to increase these figures substantially. GOVERNANCE AND ANTI-CORRUPTION We thanked the US government very much for the cooperation we have received in our effort to recover stolen funds. Our two governments have put the machinery in place for their respective Attorneys-General to collaborate in ensuring the return to Nigeria of over five hundred million United States Dollars ($500) of looted funds siphoned away in banks around the world. In this connection, we congratulated the US government on launching a Kleptocracy Asset Recovery Initiative which was spearheaded by the US Department of Justice (DOJ) Asset Forfeiture and Money Laundering. We hoped that we could continue to count on US support in this area. HUMAN RIGHTS The Government of Nigeria remains deeply committed to the principles of human rights as well as the promotion and protection of people’s freedom, even in the process of fighting terror. We commit to ensure that all documented cases of human rights abuses are investigated and those responsible for violations held accountable for their aIt was reported that the actions. that President Trump expressed concern over the insecurity in Nigeria saying his administration will do something about it. Trump said this on Monday, April 30 when he met with President Muhammadu Buhari at the Oval office. Nigeria has been battling Boko Haram insurgency although the present administration has claimed technical victory over the terrorists.